The Texas Longhorn baseball team got swept by an average Kansas Jayhawk team to fall to 2-4 in conference. The Longhorns have now lost four straight and five of their last seven after a series win against [tag]Stanford[/tag] propelled them to number one in the nation. The Texas bats once again failed to come through. The Longhorn pitching staff has yet to give up more than six runs in a game. 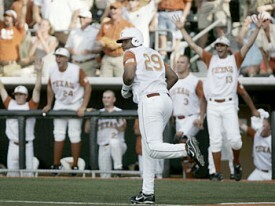 Conversely the Texas offense has only recorded over six runs one time in the last 12 games. For the few series of the season the pitching staff dominance was enough to carry the team to victory, but since conference play has began it simply hasn’t been enough. Both the starters and the bullpen had a solid weekend. Texas gave up five runs in the first game and four runs in the next two. In college baseball, remember the bats are metal, five runs shouldn’t win you many games. Texas has failed to come through with runners in scoring position all year. [tag]Augie Garrido[/tag] believes in the sacrifice bunt. That is a fact, a fact that Texas baseball fans just need to swallow and get over. It will not change. The man is the all time leading college baseball coach in team wins. He has won titles at two schools, with two completely different budgets. Again, he is not going to change. As long as he is the coach the Longhorns will scrap to get on base, move people over, and count on clutch hitting, good defense, and solid starting pitching. Unfortunately the bats are not coming through, and when you give up outs to move people along each at bat is magnified. And right now there are too many blemishes in the current lineup to play with less than 27 outs. Because of that this team will go as far as the pitching staff can carry them until the bats wake up. If they ever do. The good news is Texas will enter every series, except maybe with [tag]Baylor[/tag], with the best overall pitching staff. The problem is that teams like Baylor, [tag]Missouri[/tag], [tag]Oklahoma State[/tag], and possibly Texas A&M have a number one starter that is better than [tag]Chance Ruffin[/tag]. If opposing teams can take the first game it turns every series into a must sweep on the weekend. This already happen with Missouri. Texas has the bats in the lineup and on the bench to compete with any team in the nation. The question is not one of talent. Right now it doesn’t look like the bats fit the get them on, move them over, bring them in strategy of Longhorn baseball. Augie ain’t going to change. Will the bats? Connor Rowe slides back into the newly FieldTurfed first base during the season opener. With [tag]Augie Garrido[/tag] watching from home the 2009 Texas Longhorn baseball team got the season going on the right foot sweeping four games against Illinois-Chicago. This year’s version of Texas baseball looked to be a throwback to the 2002-2005 Longhorns. 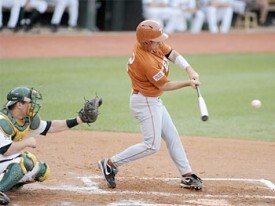 Texas won 6-1 Friday, took the double header Saturday 3-1 and 10-1 (in seven innings), and 1-0 on Sunday. Texas’ pitching staff showed off all weekend combining for a 0.79 ERA and striking out 24. Texas has four capable starters in [tag]Chance Ruffin[/tag], [tag]Taylor Jungmann[/tag], [tag]Cole Green[/tag], and [tag]Brandon Workman[/tag]. All four of them went at least six innings and none of them gave up more than one run. And the best part is all of them are not yet draft eligible. It wasn’t just the starters that were on display in the opening series. Newly appointed closer senior [tag]Austin Wood[/tag] was nearly perfect in his two appearances, both of which were for two innings to finish off games. Wood gave up only one hit and walked one batter. Defensively the Longhorns were stellar. For the weekend Texas committed one error. Last year’s ball club struggled defensively all last season. Garrido teams usually defend well and this year’s team looks to fit the mold early. The new surface provides truer bounces and speed so look for the defense to be much improved, especially in the infield. Offensively Texas did enough. The Longhorns won’t have the pop they did with [tag]Kyle Russell[/tag] in the lineup, but Texas will make contact and stay on the base paths. The Longhorns only registered six extra base hits in the series, but did a good job of getting runners on with one and two outs and using the sacrifice bunt to produce runs. Some fans might not like it, but it works. And it will work even better on the new and slow motion playing surface. Overall it was just one weekend, and in baseball fortunes can change quickly, but Garrido has shown his recipe for success in the past: pitching, defense, sacrifice bunts. This team showed all three this weekend in the sweep over a pretty good ball club. Mentally Texas has been lacking after the run early in the decade. Changing that mentality will decide if this team has a trip to Omaha in their future.